Abstract: Standard features of the board consist of Serial ATA/Serial ATA RAID, Ultra 133 IDE RAID, IEEE 1394, 5.1 audio, Intel CSA enabled Gigabit LAN, dual BIOS's and Gigabyte's special DPS2. While almost all i865PE/i875P based motherboards have Gigabit LAN, we're happy to see that Gigabyte chose to use the Intel CSA enabled 82547EI NIC. Because the board supports a whole host of high bandwidth devices (USB 2.0, IEEE 1394, Serial ATA RAID, etc) the PCI bus can be saturated very quickly. With the CSA Intel NIC, you're not going to make a potentially bad situation worse. 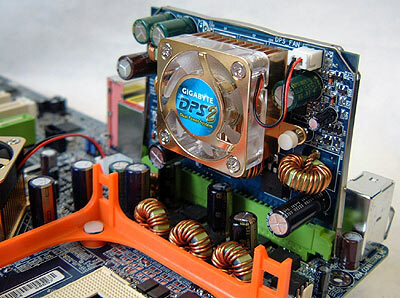 Intel officially stated that the current batch of i865PE/i875P based motherboards do not support the upcoming Socket 478 Prescott processor (typical...) because of voltage regulations and differences, however there are rumors out there that the Gigabyte 8PENXP in fact does support the chip thanks to its Dual Power System. Of course whether the board or not will indeed be compatible with the Prescott will not be known until the processor is released later in 2003. Officially the DPS2 should relay 'cleaner' power to the processor which should lead to better stability (it is 6 phase instead of 3 phase). Our particular motherboard worked just fine without the unit plugged in, even when overclocked. 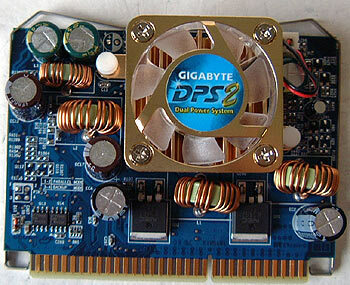 Gigabyte's 8PENXP is the only i865PE motherboard on the market to have six DIMM slots. Unfortunately because the i865PE can only support up to a maximum of eight banks of memory (each side of a DIMM is one bank), if you're using double sided memory you can only use four of the memory slots. Potentially though, if you're using single sided DIMM's you should be able to fill all the slots. The only complaint I have about the motherboard is that there is no clear CMOS jumper. 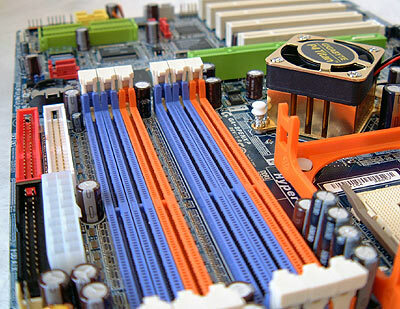 Instead, users must short two solder points on the motherboard if they wish to reset the CMOS.